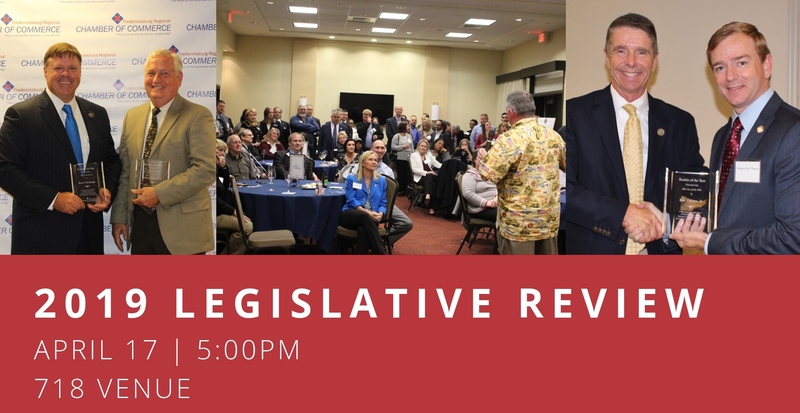 The Fredericksburg Regional Chamber of Commerce and Fredericksburg Area Association of Realtors invite you to join us for an evening with our local elected officials to network and to discuss the issues facing your businesses. We will also be presenting the 2019 Delegate of the Year and Senator of the Year Awards. We believe it is not only mutually beneficial but also imperative that we provide a shared platform for our regional stakeholders, such as elected officials, top business owners, and non-profits. Each year, the Chamber recognizes legislators who are true champions of commerce for businesses in the Fredericksburg region. We evaluate all 11 senators and delegates through our Legislative Scorecard, which tracks the 15 bills that will have the biggest impact, either positive or negative, on our membership. As the voice of the business community, the Chamber's legislator awards are the best indication of a legislator who values businesses and free enterprise. Includes appetizers and 2 drink tickets.